We have taken our time to go to Joint. This is not because we were unwilling or because we have decided to go on a vegetarian diet, but because the queues are so long. But on this cold Saturday morning in February we thought we owed it to our readers to brave the long lines. So after much feet stamping and wishing we had two pairs of socks and gloves, we got a table – only about 15 minutes, although it seemed longer, even with the ideal opportunity to stare at the tourists who are now flocking to Brixton Village. 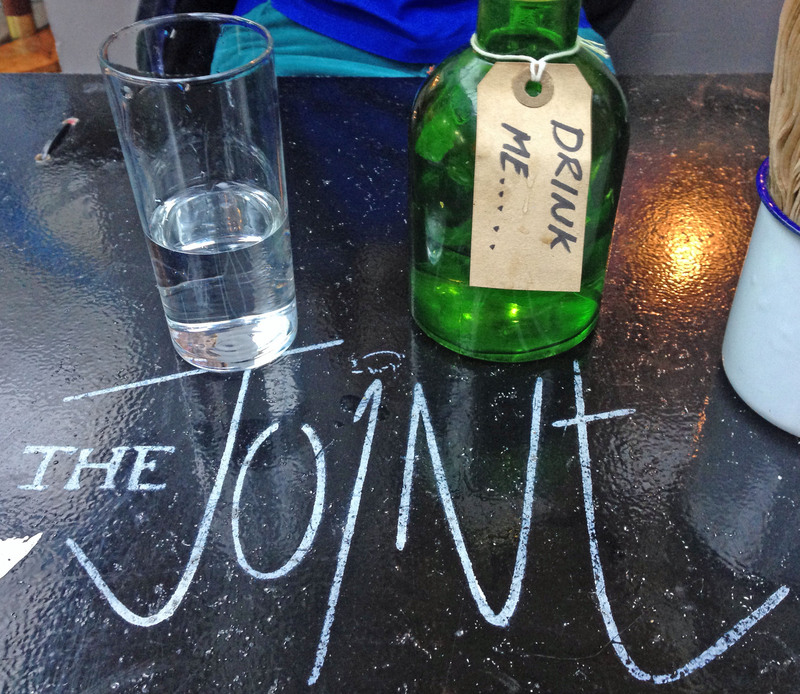 Joint is a small kitchen with all its tables outside in one of the cross avenues in Brixton Village. The base of the tables is made up of three of the plastic baskets that the bread buns are delivered in, which are topped with squared off black wood. The seating is a hard stool or, if you are lucky, a bench where you can rest back against a shop window. That is probably why it is pretty quick – the service is speedy and it is only comfortable for 30 minutes or so. The menu is short and all except the bread is baked on site. It is packed with everything for the hungry carnivore. Starters are ribs, chicken wings, onion rings, sweetcorn and Hush Puppies (I thought they were shoes). For the main course it is pulled pork or chicken, either barbecued or “Asian” style (with a little spice), and both can come in a bun or a wrap. There is one item for veggies, which we will leave out in this haven for animal eaters. We chose onion rings, barbecued ribs, an Asian chicken wrap and pulled pork in a bun. The ribs and the onion rings come wrapped in a greaseproof paper bag tied with a paper tag describing the contents and the wrap and bun came on paper plates craftily covered with greaseproof paper so they don’t fall apart. We learnt the hard way that you need to be hungry, as we still haven’t opened the barbecue ribs. The onion rings were really crispy, as if they had semolina in the flour and had a wipe of barbecued sauce. The latter is a bit sweet but went well. The wrap was not as spicy as expected but had a mixture of pleasant flavours that ran all the way through – you didn’t have to eat an enormous amount of bread before getting to the filling. The bread is produced in partnership with Bad Boys Bakery from HM Prison Brixton. The bun is unusual. It is sourdough but is soft and yellow – not pale lemon, more cadmium.. Then there’s the taste …. it has vanilla and is sweet – as sweet as a Macdonald’s – which probably comes from the added fig. The bun is filled with pork, lettuce and coleslaw and, of course, some secret ingredients involving apple candied bacon. The proof of the pudding is in the eating and the wrap is pretty easy. However, the bun defeated me but, luckily, the waiter noticed and offered a knife and fork. This saved me from going home and having a bath, as the juices have the habit of running down your arms. The bun really filled the hunger gap and was certainly better than the usual pork bun. I would have preferred a little less sweetness as the sauce and the bun were a bit cloying but the pork was really good. I didn’t manage it all. We washed the whole thing down with water in a cute bottle with a paper tag collar saying “Drink me”. The drinks are relatively few but we noticed that there is a close relationship with the Burnt Toast Café which also serves good coffee, which will keep you warm while you wait. The service is good and thoughtful and the price of our meat feast – just £19.00. It isn’t something I would choose for a leisurely dinner but it is certainly worth the wait for a really filling lunch or bite to eat before the cinema. This is really good fast food and is open Thursday to Sunday.